Hi everyone! I'm back with a quick tutorial for Felt Baskets! I made these as a cheap option for baskets to go in our mudroom shelf--which you'll be hearing more about tomorrow. These are super simple and super cheap. I spent a whopping 5 dollars on 2 yards of felt and had enough to make 3 baskets, a hanging organizer and still have felt left over. All you need to do is sew a seam-- it doesn't even need to be straight! First, a note about shopping for felt. Some felt can be thin and icky feeling. I like to purchase premium felt off the bolt, and I make sure to find a color that has some variegation to make it look more natural. Next we need to do our math. 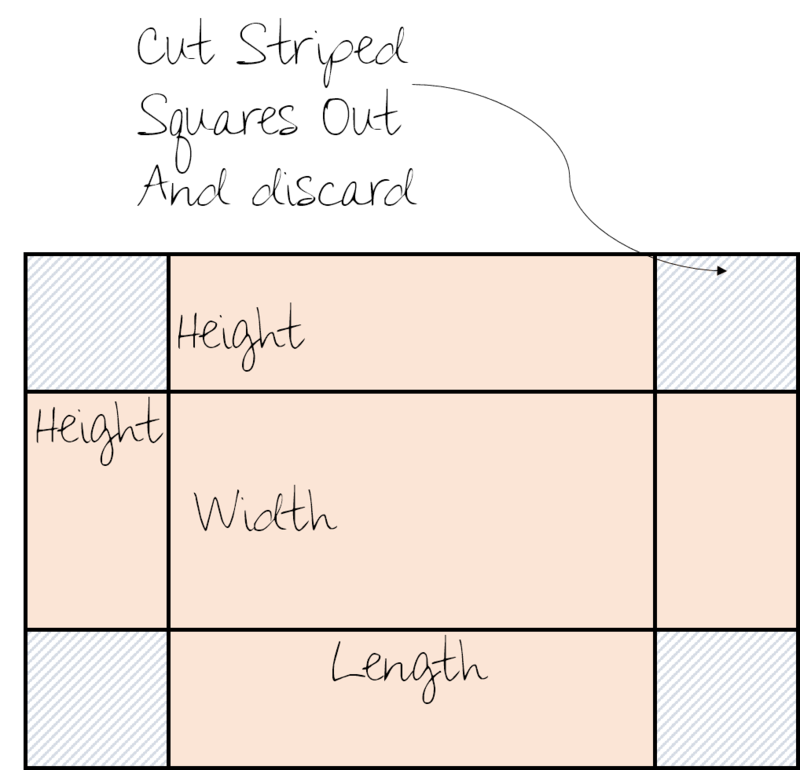 Instead of a formula I thought it might be easier to explain how to come up with your rectangle size in a diagram. Use the height, width and length of your desired basket to cut your big rectangle. Then cut squares out of each corner. (The sides of the squares will be the same as your basket height.) If you feel your felt is thin, cut two boxes, lay them on top of each other and treat them as one piece for the rest of the tutorial. For me, the hardest part of this project was cutting the felt. I really, really suggest getting a sharp rotary cutter for this project. Mine was too dull and just ended chewing up the felt. Instead I had to trace lines and cut with (gasp!) scissors. The humanity! When you are finished, you should have something that looks like this but better. This was my first attempt with my rotary cutter. Now, pinch each of the sides wrong sides together, and sew about a quarter inch in from the edge. I trimmed the seam allowance a bit to hide any wonky sewing and cutting. You can embellish them any way you wish. For one of my baskets, I folded down the top and hand embroidered a running stitch in felt. I love the way the exposed edges look. On this basket I used a double thickness of felt for a super sturdy basket. This one will keep our wallets and stuff so it will be used constantly. I also made baskets out of just a single layer of felt. I was suprised that they seemed just as sturdy. Instead of doing a cuff, I just sewed a small decorative seam on the bottom edge of the long sides. I love handsewing through felt, so I'm planning on embroidering these with something... maybe my kids names? Right now they just hold our reusable plastic bags. In case you were curious, the rest of the fabric became this cute hanging organizer. Thanks, and I'll see you back here tomorrow for a mudroom sneak peek! And I hope you all are getting ready for Pillow Palooza!